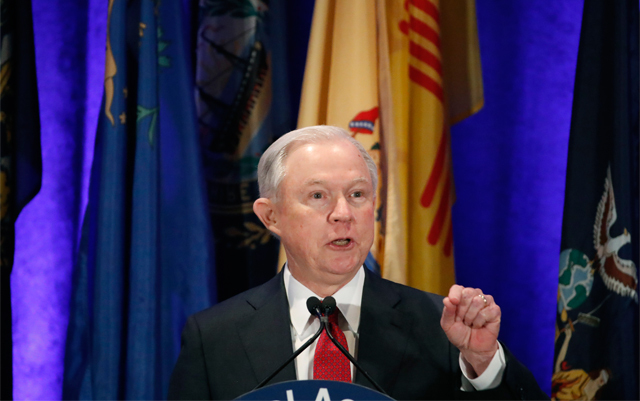 In a meeting with reporters earlier this week, new U.S. Attorney General Jeff Sessions had more to say about marijuana, especially about states where voters have decided to legalize marijuana for medical or recreational purposes. There is no doubt that the new AG is leaving the door open for as much enforcement of federal marijuana laws as he feels like undertaking. Taken in conjunction with Trump Administration Press Secretary Sean Spicer’s comments last week about greater marijuana “enforcement,” Sessions stance is discouraging indeed. The ironic thing about that last statement is that the only violence that is “around marijuana” is created specifically by its prohibition. Al Capone rose to fame and fortune under alcohol prohibition but when’s the last time have you heard of hitmen from Anheuser-Busch taking out some sales reps from Coors? The risk that comes from prohibition makes marijuana much more valuable than it otherwise would be; when something is illegal and profitable, violence as a means of settling disputes becomes an obvious option. It’s clear that Jeff Sessions has very little knowledge about marijuana or the effects of its prohibition. That’s not a huge problem when it’s Joe Sixpack on the street, but this is the man with the ultimate power over the course of cannabis legalization in the U.S. So the question then becomes, how do we educate our new AG? There is the unlikely possibility that someone close to Sessions, whom he trusts, will explain the facts to him, but that’s not what we should hang our hopes on. Make your voice heard by every available means: phone call, email, social media, text, Facebook message, gif, meme, rally, march, telegraph and carrier pigeon. The louder our voices speak out, the greater chance of someone with power hearing us. Support all efforts by the states to resist federal pressure on marijuana laws. Dozens of lawmakers and officials have already come out and said they will stand in the way of any federal crackdown on legal marijuana. Those officials are the last line of defense when it comes to stopping a federal assault. And now…not long after his tough talk speech and his nearly 100 year old rhetoric why he must sternly enforce federal laws against cannabis, media news outlets are reporting the Attorney General spoke to the Russian UN Ambassador. Well that was fast!! GOODBYE AND GOOD RIDDANCE! Hope to wake up to the AG submitting his resignation. This also puts him completely out of work because he vacated his Senate seat. Good people don’t lie to Congress. Marijuana is not a gateway drug. I have over half of the diagnosis for medical use but my state lost the vote. The new ag wasn’t a good congressman. Teenagers are going to try more things if they are intoxicated and most likely to drive. Mr AG have a smoke and see how you feel afterwards. You are not going to want to leave home or drive anywhere when you know you are safe at home. What happened to the states choice and all the money this drug has brought into those states? That’s billions of dollars going into the state instead of drug dealers or the cartel. Pain meds are hard to get and those of us that do get them would tell you a few tokes of mj work better than the opiods we are supposed to be taking. You get taxes off of the drug way more than alcohol and cigarettes. What happened during the inauguration when it was being handed out on the streets? Not a darn thing. Just like anything else you take daily your body gets used to it. If it was legalized I could get rid of half my meds I’m taking. Good luck on next election.